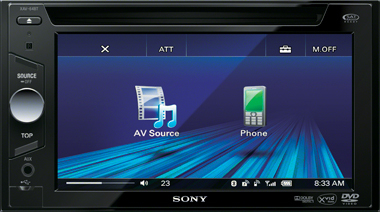 Let the brilliant double DIN 6.1″ touch screen of the Sony XAV-64BT display entertains and informs you with an easy-to-use, advanced response interface sure to please. Pop in a DVD and turn your car into a mobile movie theatre keeping everyone quieted down on long road trips. Quickly connect, charge and control your iPod, iPhone or music player via front USB 1-wire input. Gesture command and on-screen touch buttons make everything easier to control and separate audio and video power supply circuits provide added clarity. Connect your iPhone or iPod Touch via the optional RC-202IPV cable to playback video and audio or display compatible apps on the receiver screen. Passengers can control compatible apps directly from the iPod or iPhone with Passenger App Control. No need to mess with wires – Bluetooth technology delivers convenient wireless playback, hands free smartphone access and Pandora radio app control. Get the Pandora music you love on the go with complete access to your Pandora account via your Android or Blackberry phone. The high-resolution TFT (WVGA) 6.1″ touch screen display will inform and entertain you. Gesture command and on-screen touch buttons make everything easier to control and separate audio and video power supply circuits provide added clarity. Playback audio/video from most iPod models via the RC-202IPV video cable. Also view stored album artwork during audio playback on the screen of the XAV-64BT receiver. Multi-format playback1 lets you play MP3, WMA, AAC music files, JPEG’s or MP4 videos. The Advanced Sound Engine uses EQ7 equalizer, adjustable LPF/HPF crossovers, Listener Position calibration, Center Speaker Organizer, Rear Bass Enhancer, and Dynamic Loudness volume leveler to create an ideal in-car listening environment. Connect your iPhone or iPod Touch via the optional RC-202IPV cable to display compatible app content on the XAV-64BT receivers display and control the app directly from your iPhone or iPod Touch with passenger app control. Use the ZAPPIN feature to play 6, 15, or 30 second intro clips to help you find a specific song. The XAV-64BT integrates seamlessly with Satellite Radio and HD Radio using Sony Bus adaptors so you can receive digital satellite radio or HD Radio broadcasts. 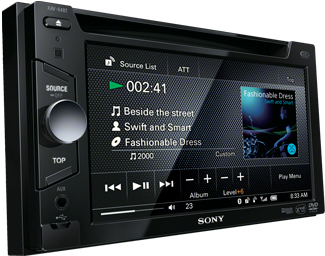 The dedicated rear auxiliary AV input provides additional source playback and a connection for the Sony XA-800C rear view camera (sold separately) for visibility when backing up, especially with larger trucks or SUVs. Front USB input lets you connect almost any portable USB audio device to your system. Connect, charge, and control your Walkman player, most iPod, iPhone or other USB devices via the front USB 1-Wire input and view song title and artist on the display. Enjoy fast touch screen response when selecting sources, transitioning between menu screens and searching through your USB music content. Organize your music into playlists that perfectly match your mood, scene and location, making it easier to choose the music that fits the moment with the SensMe application. Whether using the internal 52W x 4 high power amplifier for your speakers or the 2 Volt Front and Rear/Sub selectable RCA pre-amp outputs to feed an external amplifier, you can dial in the output for optimum sound. Output Power : 52W x4 Watts Max Power – CEA2006 Standard Power Output: 17 Watts RMS per channel into 4 Ohms, 4 channels driven from 20 Hz to 20 kHz with less than 1% THD+N. This time round I have used the blurb from Sony’s Spec Sheet, the reason for this is that I don’t think I could of said it any better! I have been used this unit for a while in my work/daily car and it is just a gem of a unit, easy to use and I love using the gesture controls. With a quick swipe of the screen I can change songs/albums while not even looking at it! On a closing note the XAV-64BT must be one of the best priced quality double-din Bluetooth units on the market and this alone makes it a worth while unit to buy in comparison to single-din unit at a similar price range!